A couple of weeks ago I bought a Surface Pro 4. I had thought about waiting for SP5, but that’s an endless spiral–at some point you just have to buy the tech thing you want, knowing that it will all too soon be superseded by a newer model. So far, though, I’m pleased with the SP4. It’s as light and portable as I had hoped, making my former portable seem ridiculously ponderous, although it too had seemed like a featherweight when new. I like the Surface Pro’s screen and keyboard a lot. The battery life has received some criticism but seems fine to me. However, I don’t game, edit video, or run multiple demanding apps simultaneously, so YMMV. I haven’t yet mde much use of the SP4 as a tablet, although perhaps that factor will grow on me. Mostly I wanted a portable robust enough to serve as my sole computer, at least on an interim basis, if and when my touchscreen desktop machine dies. My main tools–Scrivener, OpenOffice, and Evernote–run beautifully on the SP4, so I’m happy. 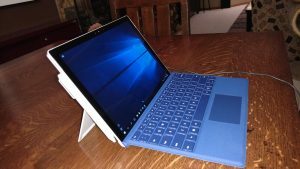 This entry was posted in Computers and tagged Computers, Scrivener, Surface Pro 4 on December 17, 2016 by Rebecca Stefoff. I got a new computer this week. I went retro and got a desktop, which was kind of a big deal. Every computer I’ve ever had, all the way back to the Kaypro II I bought in 1982, has been a portable. The Kaypro was the size and weight of a 1950s sewing machine, maybe one with a couple of bowling balls tied to it, but technically it was portable. A series of ever-sleeker and more powerful laptops, mostly Toshibas, followed it over the years. The most recent went into commission in June 2007, just before I went to New Mexico for Taos Toolbox. Five years is a long lifetime for a laptop that functions as a writer’s primary computer. My work spreadsheet reveals that I’ve written 31 nonfiction books on it, in addition to tens of thousands of words of fiction, correspondence, journal entries, and blog posts. I needed a new machine–but what to get? For years I’d staunchly maintained that only a portable computer would do for me. I liked knowing that I could take it anywhere, and I did take my laptops on quite a few journeys. But now that I have a smaller, lighter, netbook for travel, and do email on my phone, and will soon have one of these, it’s been a few years since I moved my primary computer at all. So why not think outside the laptop box? I chose an HP all-in-one that actually takes up less space on my standing desk than the Toshiba laptop. I didn’t get the biggest or the flashiest screen, just a 20-incher, but trust me, it’s like Cinemascope next to the 15-inch laptop screen I’ve comfortably used for lo, these many years. Not great news, productivity-wise: movies and video look really good on it. The wireless keyboard and mouse that came with the computer are cheap and janky, but easily swapped out for something better. Otherwise, I’m happy with it. Did I mention the touchscreen? It’s sweet. I may never mouse again. This entry was posted in Computers, Standing desk and tagged Computers, Standing desk on June 28, 2012 by Rebecca Stefoff. 3) Marshall Cavendish’s little FB post is about 40,000 times better-looking than my own two crapulous websites, which are the Internet equivalent of tarpaper shacks and waaaay overdue for a makeover. Which in turn has made me resolve that when I get back from Iceland I will either learn how to build a decent website and do so, or pay someone to do it. I’d love to launch shiny redesigned sites with a splash about the Human Evolution series, which is coming off press soon. This entry was posted in Computers and tagged Computers on July 16, 2009 by Rebecca Stefoff. So many things can be used for either good or evil (or idle). So that’s my little arsenal. Anyone else have any writing-related tools to recommend, or any experiences with these to share? This entry was posted in Computers, Writing and tagged Computers, Writing on August 14, 2007 by Rebecca Stefoff.